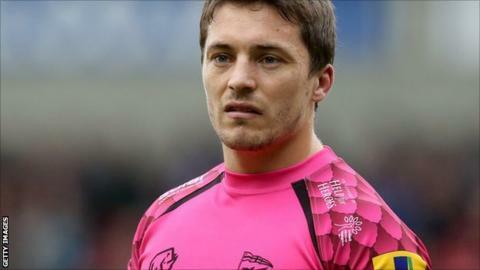 London Welsh lost their opening game in the European Rugby Challenge Cup, with Lyon scoring four tries in the win. Lyon held a narrow 21-15 lead at the break with Ricky Januarie, a penalty try and Franck Romanet crossing, while Chris Elder and James Lewis responded with tries for Welsh. Tristan Roberts sent over his second penalty of the game for Welsh, to go with a conversion, shortly after. However, Waisele Seru Sukanaveita's try sealed the Pool Four victory for Lyon. Welsh, who have also lost all six of their Premiership fixtures so far this season, fell behind early on when Januarie finished off Stephen Brett's superb run, while Fabrice Estebanez slipped when clean through soon after. The Exiles then conceded a penalty try and lost Rhys Crane to a yellow card in the process, with Jerome Porical sending over his second conversion. The Premiership side's first points came through the boot of Roberts but Lyon scored again with a fine solo try by winger Romanet which Porical again converted. Welsh scored two quick-fire tries before the break, with Elder going over in the corner after good work by the forwards before Lewis crossed two minutes later for a try which Roberts converted. It meant Welsh trailed by six at the break and Roberts cut that deficit in half after the restart with his second penalty of the game. Lyon wasted several penalties and decent territory as they looked to restore their advantage with Welsh still only three points behind after an hour. But Seb Stegmann was sent to the bin and the Welsh defence eventually succumbed to the pressure on them as Sukanaveita went over to stretch the lead, with Porical converting for 28-18. Rhys Crane and Nic Reynolds both went close for Welsh but Lyon held firm to seal the victory. Lyon: Porical; Romanet, Bonnefond, Estebanez (capt), Regard; Brett, Januarie; Matadigo, Derrien, Nzi; Njewel, Cerqueira; Roux, Mapusua, Mavinga. Replacements: Bonrepaux, Balan, Felsina, Tuineau, Lambey, Loree, Seru Sukanaveita, Loursac. London Welsh: Elder; Awcock, Reynolds, J Lewis, Crane; Roberts, R Lewis; Cahill, Dobson, Gilding; McNally, Corker (capt); West, Thorpe, Pienaar. Replacements: Vella, Reeves, Cooper, Schofield, Browne, Rowley, Ross, Stegmann.